The Chardonnay Symposium returns to the Santa Maria Valley Friday, June 29, through Sunday, July 1, with events ranging from a barbecue at Sierra Madre Vineyard and a winemaker seminar moderated by Wine Enthusiast Editor Steve Heimoff to an outdoor concert Sunday. The weekend is sponsored by the Santa Maria Valley Wine Country Association, the organization behind the promotion of the region’s wineries, vineyards, hotels and other tourist-related businesses. The annual symposium remains the only event of its kind dedicated to chardonnay, Slaughter said. During the Friday night barbecue and BYOChardonnay at Sierra Madre Vineyard and Saturday’s day-long events at Byron Vineyard and Winery, the more than 60 participating winemakers will strive to educate participants about the varied styles of chardonnay and the climate and soil conditions under which the Burgundian grape varietal thrives. Its cooling marine influences make the Santa Maria Valley AVA a top region for growing chardonnay, Slaughter said. The eight chardonnay producers scheduled to participate in Saturday morning’s panel include the 2011 Wine Enthusiast Winemaker of the Year, Bob Cabral of Williams Selyem; Jenne Lee Bonaccorsi, Bonaccorsi Wine Company; returning 2011 panelist Dieter Cronje, Presqu’ile Wines; James Hall, Patz & Hall; Eric Johnson, Talley Vineyards; Heidi von deer Mehden, Arrowood Vineyards & Winery; Bill Wathan, Foxen Winery; and Graham Weerts of Stonestreet Wines. The local chefs who will demonstrate their talents and provide samples for tasting include Budi Kazali of The Ballard Inn; Alfonso Curti of Trattoria Uliveto; and Ryan Gromfin, consulting chef for the Santa Maria Inn, Slaughter said. Friday’s BYOC (Bring Your Own Chardonnay) Barbecue at Sierra Madre Vineyard includes a gourmet Santa Maria-style barbecue, music and dancing. Cost: $30 per person. Among the other symposium events are a Kenneth Volk winemaker dinner Saturday evening, a sparkling chardonnay Sunday brunch at Cottonwood Canyon Winery and a “Pops in the Vineyard” concert Sunday afternoon at Tres Hermanas Vineyard. Details: http://www.thechardonnaysymposium.com, or http://www.smvwines.com. Media sponsor of the June event: Wine Enthusiast. Transportation: Included in the $95 cost of Saturday’s Heimoff seminar and the Grand Tasting is shuttle transportation from the Santa Maria Radisson Hotel to Byron Vineyard and Winery; parking on-site at Byron will be $20 per vehicle, organizers say. All events Friday through Sunday are listed on the Chardonnay Symposium website. Taste in the Vineyard, Santa Barbara County — Spend a morning or afternoon in the tranquility of Santa Ynez Valley vineyards with exclusive access during a walking tour, led by Lee Tomkow. Learn how vines are managed and how wine is produced from a guide who will detail clonal differences, rootstocks and how to identify varietals, among them syrah, sangiovese and grenache. Tour times: 9 a.m. to noon, or 1 to 4 p.m. daily except Saturday. Reservations required; each tour limited to 10 people. Cost: $50 per person. Information and reservations: 693-4424, or http://www.vineyardwalkingtours.com. 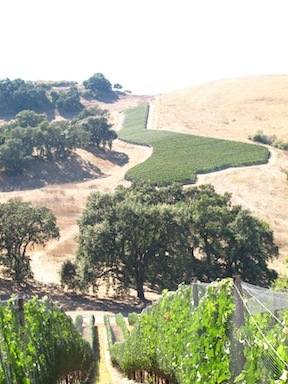 Refugio Ranch photo/The Alban 174 syrah clone is planted on a hillside at Refugio Ranch. A vineyard nestled in a cooler pocket of the southern Santa Ynez Valley is producing some of the region’s newest wines crafted in the spirit of cowboys and ranch lore. Refugio Ranch Vineyard, owned by the Gleason family, is a 415-acre property, with approximately 25 acres planted to sauvignon blanc, malvasia bianca, roussanne, sémillon, viognier, grenache and syrah, said proprietor Kevin Gleason. Gleason’s adult son, Max, an artist based in New York City, designed the art that adorns Refugio Ranch’s label, and supervises the brand’s aesthetics; winemaker Ryan Deovlet of San Luis Obispo’s Deovlet Wines produces the label; and Reuben Salazar of Coastal Vineyard Care manages the sections of vineyards that line the estate’s hillsides and valleys. The bucolic property itself, a former cattle ranch, is the heart and soul of the Refugio Ranch label. Max Gleason’s artwork is both “rustic and contemporary,” said his father, Kevin. With crop cultivation, “sometimes it’s a matter of sitting back and listening to the property,” Deovlet noted. Deovlet told a visitor he feels “like an adopted member” of the Gleason family; indeed, he, father and son Gleason finish one another’s sentences, and appear comfortable as a unit. During a May 16 industry open house at Refugio Ranch’s newly opened tasting room in Los Olivos, Deovlet joined Max, Kevin and his wife, Niki, and the tasting room staff in pouring wines from behind the spacious bar. Refugio Ranch Vineyard premiered with the 2008 Barbareno (a blend of petite sirah and syrah), and the 2009 Sauvignon Blanc, Deovlet said. The barbareno’s components are 63 syrah and 37 petite sirah, with about 4 to 6 percent viognier and 2 to 3 percent malvasia bianca, he explained. roundness and elegant balance, and the 2010 more mineral driven and crisp on the palate. The 2011 vintage is “a blend of the two previous styles,” and contains a percentage of sémillion, a Bordeaux varietal that’s a mainstay in white blends as well as being the key grape in Sauternes. The 2011 will be bottled later this summer, Deovlet said. The label’s second white varietal blends two key Rhone whites, roussanne and viognier. The 2009 vintage was a 55-45 split of roussane and viognier, and the 2010 a 60-40 mix. The 2009 utilized no oak, and 2010 just 15 percent new French oak barrels, Deovlet said. Deovlet describes his palate as “Old World,” one that favors “pristine aromatics” and the characteristics of “wet stone.” He favors concrete for fermentation, and calls the utilization of such containers his goal for Refugio Ranch. The Gleasons and Deovlet emphasize that the property’s soil structure “drives the viticulture” practiced at Refugio Ranch. “The soils are heavier with clay, and we need cover crops to take up the water to create a competition with the vines,” a process that creates more intense fruit as the vines “fight” for water, Deovlet noted. He reiterated that the property is a cool one, with about “5 degrees difference in temperature a factor that pushes us into “the red zone” as far as ripening (in a timely fashion), meaning most of the site’s vines ripen later than the average for the region. The vineyard portions of the entire estate are tucked up against the hillsides on dark, rich clay soil that resembles fudge dusted with cocoa powder. The top soil layer is shallow with rock just about three feet below the surface, Max Gleason noted during a tour of the property. Theirs is the sole vineyard on the south side of the Santa Ynez River, a fact that brings “distinctiveness to the soils and the wines,” Kevin Gleason said. In their search for flavor intensity, viticulturists such as Salazar target a lean per-acre crop, and Deovlet and the Gleasons are no exception: “We’re seeking lower yields (to the point of) making several passes through the vineyard when picking. We pick, wait, and then pick again,” Deovlet said. Having a preference for the eclectic, creative side of viticulture means that Regufio Ranch team is “comfortable with the unknown,” Kevin Gleason emphasized. Mara and Callie, the youngest children of Kevin Gleason and his wife, Niki, provided Max with further inspiration for the Refugio Ranch wine label. The eldest of the daughters, Mara, is the silhouetted “Tiradora,” or sharpshooter, on the wine of the same name, the sauvignon blanc. Together, silhouettes of Niki, Mara and Callie walking are the label on “Ineseno,” the 60-40 blend of roussane and viognier. The goal for case production of the 2011 vintage is between 2,500 and 3,000, Kevin Gleason said. Details: Refugio Ranch Vineyard’s new tasting room is located at 2990 Grand Ave., Los Olivos, in part of the building that faces Highway 154. The current releases are the 2010 Tiradora, the 2010 Ineseno and the 2009 Barbareno, a 65-35 percent blend of syrah and petite sirah. Initial hours: 11 a.m. to 5 p.m., Friday through Sunday. Information: http://www.refugioranch.com, info@refugioranch.com, (805) 686-0840. John Falcone is Gainey Vineyard's new general manager and director of winemaking. John Falcone, formerly of Rusack Vineyards, has been named the new director of winemaking and general manager at Gainey Vineyard in the Santa Ynez Valley. Gainey is a family-owned estate winery and ranching operation that has been a Santa Barbara County name for nearly 30 years. Gainey produces pinot noir and chardonnay from the Sta. Rita Hills and Bordeaux varietals from its estate vineyards. The family also produces organically grown vegetables, fruits and flowers that are sold at local farmers markets and grocery stores, as well as cattle and hay for various California ranches. With his wife, Helen, Falcone produces his own label, Falcone Family Vineyards, with fruit grown on the family property in the Templeton Gap area of Paso Robles. 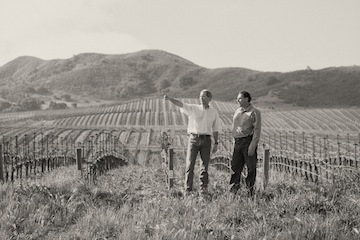 Photos by Jeremy Ball, Bottle Branding/Dan Gainey, left, and John Falcone in one of Gainey's vineyards. While Falcone will supervise all winery operations at Gainey, winemaker Jeff LeBard will continue to manage all winemaking activities and will be assisted in the Bordeaux varieties by consultant Jon Engleskirger.